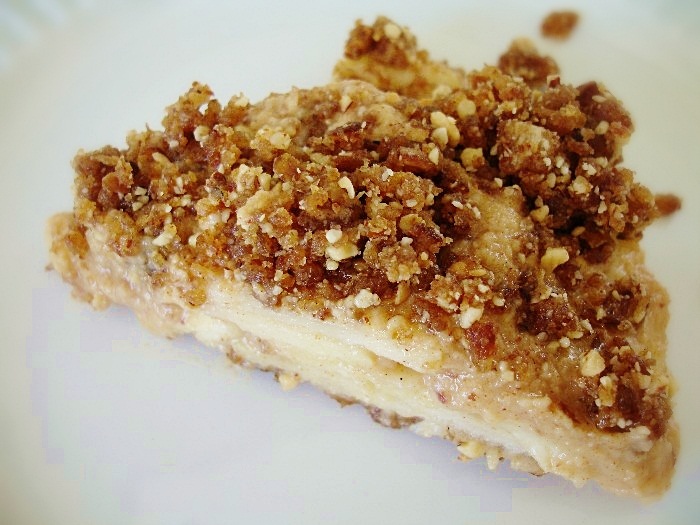 Jennifer Cornbleet’s Apple Crisp and a Raw Cookbook Giveaway! 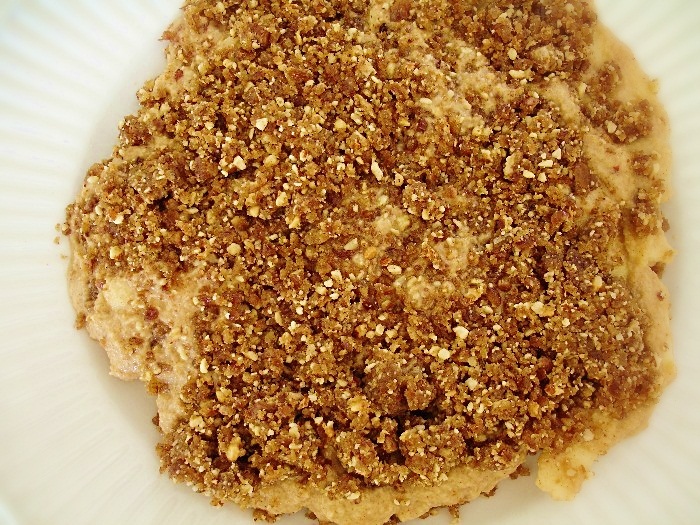 This is a recipe from Jennifer Cornbleet’s Revised Edition of Raw Food Made Easy for 1 or 2 People. I love this book. It’s among the best out there for doable raw food. The recipes are simple but delicious, and Jenny has super easy and clear instructions. Look out below for a chance to win your own copy! Place the walnuts, coconut, cinnamon, nutmeg, and salt in a food processor fitted with an S blade and process until coarsely ground. Add the raisins and dates and process until the mixture resembles coarse crumbs and begins to stick together. Don’t over process. Add the optional whole cane sugar and process briefly. Store in a sealed container. Crumb Topping will keep for one month in the refrigerator or three months in the freezer. Win a copy of Jenny’s book, the Revised Edition of Raw Food Made Easy for 1 or 2 People! This recipe sounds delicious! And I would love to win a copy of your book – I'm planning to start a partial raw diet in November and need ways to stick to a budget too. Thanks for offering this contest…. Yum – that recipe looks great! Side notes: Love the holiday banner 🙂 And…I love Jennifer's bookS! I have a couple, but unfortunately, I don't have the new, revised edition of this one. It came out about a month after I bought the original. Go figure. Wow, this apple crisp looks delicious!! Would love to win a copy of your book! Thank you 🙂 for the opportunity!! Lisa, I'm eating so much more raw food now – really getting into it and feeling great! Hope all is going well with your family. Oh, but I really do like a lot of your recipes…and the graphic design. Jennifer's recipes never disappoint – just like yours! Perfect fall recipe – and a lovely way to introduce friends to real LIFE food! 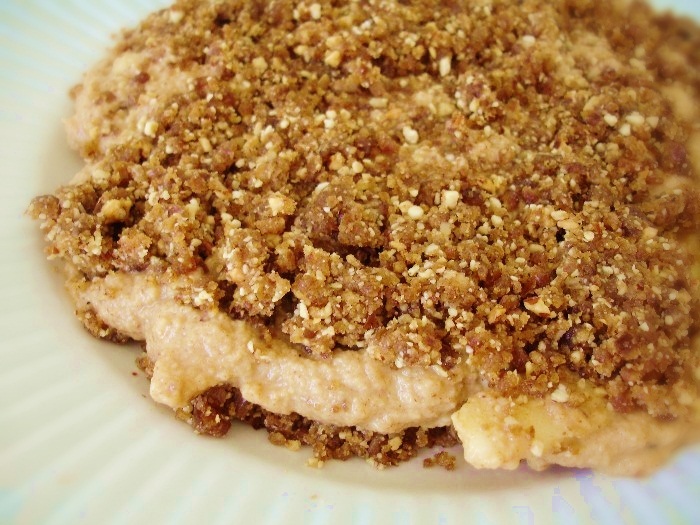 Thank you so much for sharing this recipe…three of my favorite ingredients, apples, medjool dates and cinnamon all together give me sheer joy! Cheers! would love to have this – thanks for the opportunity! Jennifer Cornbleet rocks!!! and…so does Raw on 10 dollars a day (or less)! This is the bomb! Honest & just plain good food – that's the way it's meant to be! looks really yummy – please pick me to be the winner … i'm finding being raw challenging! I also already "liked" your page on Facebook – that's how I found out about this! I have made a few of your recipes – thank-you for compiling affordable and easy – and tasty!- recipes. Most recently, I made your triple chocolate icecream ( http://rawon10.blogspot.co.nz/2012/08/triple-chocolate-raw-and-vegan-ice.html ) which turned a few skeptical non-rawists into converts! While I like eating raw foods – I guess I've never actually "made" anything except veggie sticks. Wow! This apple crisp looks really good — and I think I have all the necessary ingredients to make it. This recipe looks great and I hope I win the recipe book 😉 How do you track all of the other entries? I've done everything except for blogging and I was just wondering how you're able to track everything. I'd like to do a giveaway on my own blog someday too. Your posts make me inch toward making healthier choices. The book would help me even more 🙂 My email is texasrose_999@yahoo.com Thanks for sharing your passion with us! I bought a device to juliene vegetables and I made zuchini pasta with it…it was a perfect raw pasta with a fresh raw tomato/olive oil/garlic/basil sauce! so yummy! I would love to win this book…it looks awesome!! I already like you on facebook, but I also tweeted it (LaurasCatLamar) and shared it on facebook (Laura Cartwright). I can't seem to comment through my google account, so I just wanted to make sure that you know who I am! – I'm a follower on Facebook. – I'm a follower of this blog. – I retweeted your blog post. Love your site! I have been raw for 1 year and this cookbook would be wonderful! Thanks for the opportunity…. Next story Stew for Breakfast ~ a Raw and Vegan Recipe for Halloween! Previous story Witches Brew Smoothie ~ a Raw and Vegan Recipe for Halloween!